Aluminum flywheels are much lighter than the stock steel flywheel and that produces better throttle response and more available horsepower to the wheels for faster acceleration. The JB Racing aluminum flywheels are a direct replacement for the stock flywheel and work with stock clutch components for an easy upgrade with very little downside. Modern flywheels are built with additional components and features that are designed to dampen and minimize vibrations from the engine and transmission. As a result they have become bloated in weight and that means more energy is used up just making the flywheel spin. The weight difference between an aluminum and steel flywheel is huge - sometimes more than 50% less. Without the additional mass, more energy can be diverted to where it counts most - moving the car. The flywheel and clutch is one of the first areas that engine builders address when making the rotating assembly lighter for race engines. The dampening effect is just not needed on cars that are focused on performance. In addition to releasing more power to the wheels, the lighter flywheel allows the engine to spin more freely, which improves throttle response. Again, the difference is huge as you watch the revs build faster than before. With the engine spinning easier the power band comes up much sooner. The stock steel flywheel feels lazy in comparison. There is a driving adjustment required to get used to how much faster the engine revs but that's not really a downside. 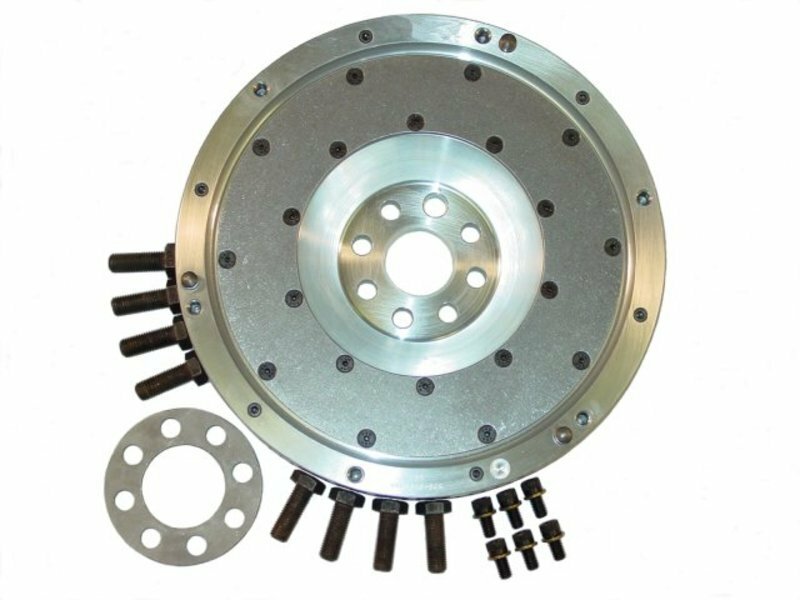 The JB lightweight flywheel is designed to be used with a factory organic clutch - the same clutch kit that you would get from any BMW dealer. This makes replacement clutch components easy to source and inexpensive when compared to specialized racing clutches. By using the factory BMW clutch, JB has also made the whole assembly easy to live with when used on the street. The clutch behaves the same as it originally did - just with better throttle response and more power! The JB flywheel can also be rebuilt with a new clutch contact surface - you don't have to buy a new flywheel. Aluminum flywheels are considered 'single-mass' flywheels because they do not have the same dampening designs as an original 'dual-mass' flywheel. With a single-mass design more noise and vibration may be noticeable. There are steps you can take to minimize the noise - heavier weight transmission oil and clutch discs with anti-rattle springs (sprung-hub clutch). In addition to the standard replacement clutches, we also sell Sachs Performance sprung hub clutches that also work with the JB flywheels.